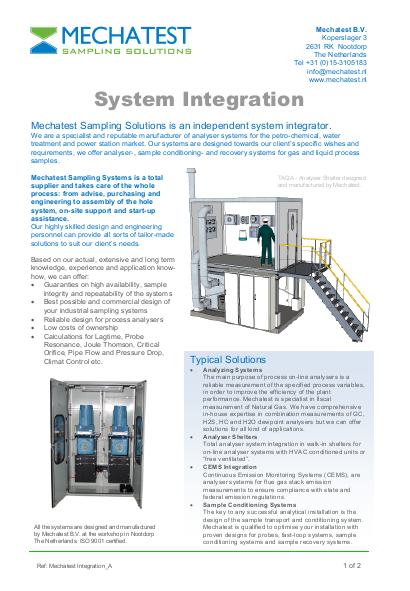 Mechatest brochure; Mechatest grab (spot) sampling systems designed for industrial or petrochemical liquids, liquefied gasses and gasses. We served applications for hydrocarbons, steam and water. 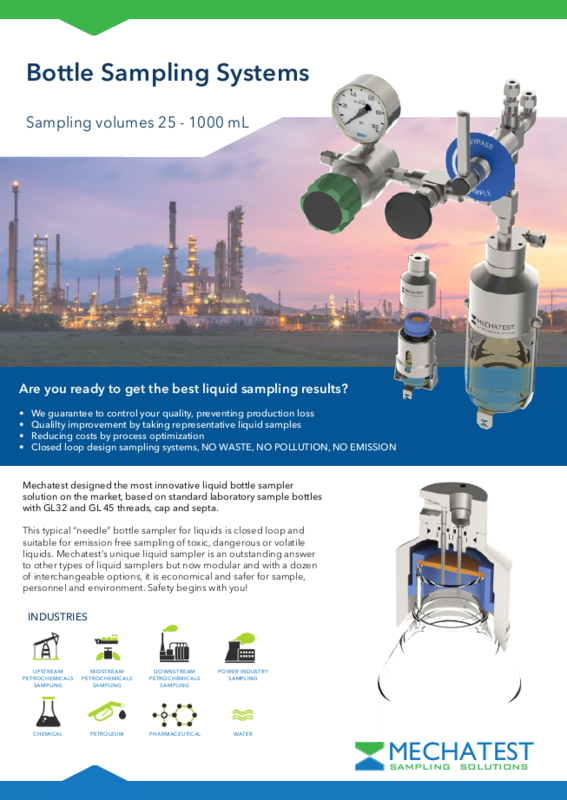 Mechatest brochure; Mechatest liquid grab (spot) sampling products designed for industrial or petrochemical liquids. We served applications for hydrocarbons, steam condensate and water. The bottle liquid samplers are a typical “needle” sampler concept for closed loop and emission free sampling of toxic, dangerous or volatile liquids. Bottle holders are designed for GL32 and GL45 screw cap and septa Duran type bottles, Dopak or custom client bottles. 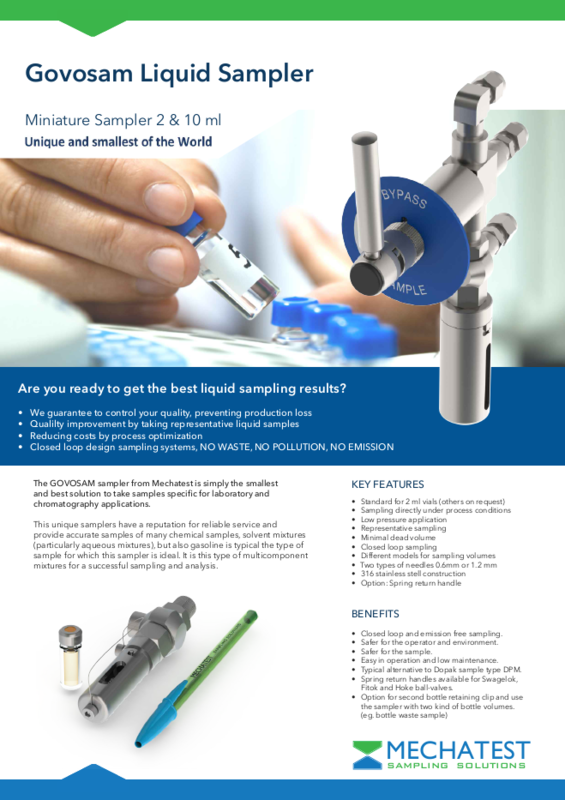 Mechatest brochure; The GOVOSAM sampler from Mechatest is simply the smallest Worldwide and best solution to take samples specific for laboratory and chromatography applications. Designed for 2 ml and 10 ml vials (other vials and/or diameter on request). 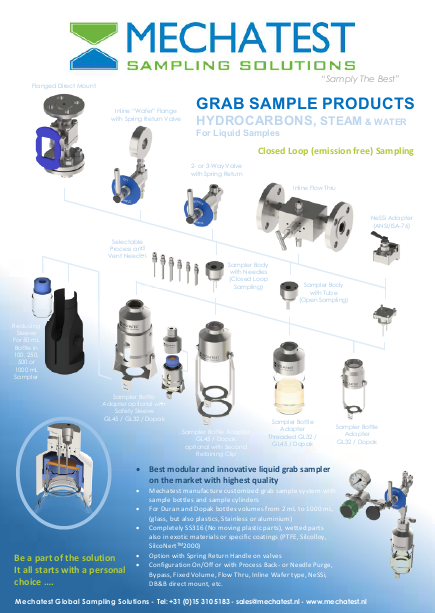 Mechatest brochure; The MBS-series liquid sampler is a typical “needle” sampler concept for closed loop and emission free sampling of toxic, dangerous or volatile liquids. Bottle holders are designed for GL32 and GL45 screw cap and septa Duran type bottles, Dopak or custom client bottles. 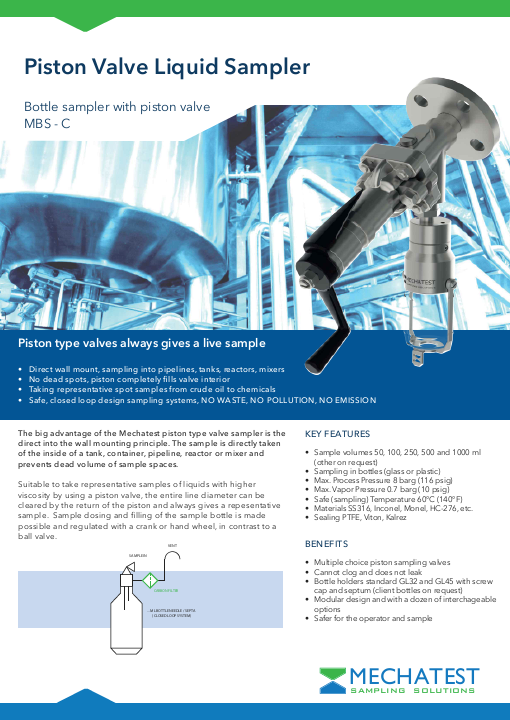 Mechatest brochure; The Piston valve liquid sampler is a typical “needle” sampler configuration with piston type valve for closed loop and emission free sampling of toxic, dangerous or volatile liquids. Bottle holders are designed for GL32 and GL45 screw cap and septa Duran type bottles, Dopak or custom client bottles. 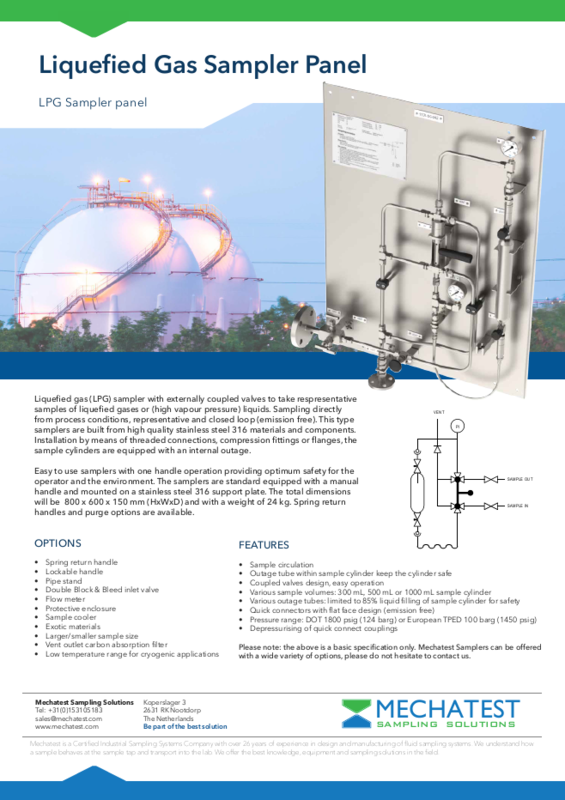 Mechatest brochure; Mechatest Liquefied gas (LPG) sampler with externally coupled valves to take respresentative samples of liquefied gases or (high vapour pressure) liquids. Sampling directly from process conditions, representative and closed loop (emission free). Mechatest brochure; Sample Conditioning Panels built as per standard ASME PTC 19.11 and/or VGB/DGRL. For proper conditioning of your steam and water samples, we take care from sample tap to sampling conditioning and analysis. 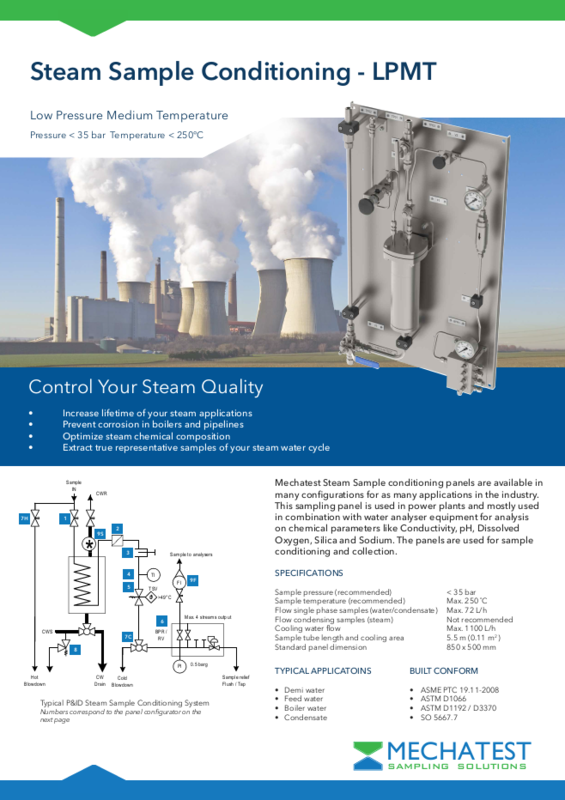 Mechatest brochure; Steam and Water Analysis Systems are mainly used in power stations for monitoring the critical parameters of boiler steam and water to ensure the water used to generate electricity is clean from impurities which can cause corrosion and scaling to any metallic surface, such as in boiler and turbine. Mechatest brochure; We are a manufacturer of analyser systems for the petro-chemical, water treatment and power station market. 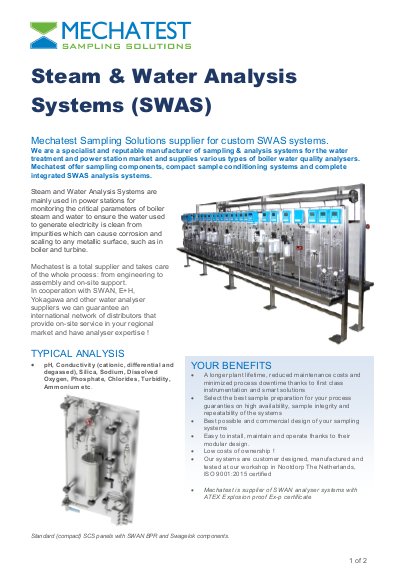 Our systems are designed towards our client’s specific wishes and requirements, we offer analyser-, sample conditioning- and recovery systems for gas and liquid process samples. 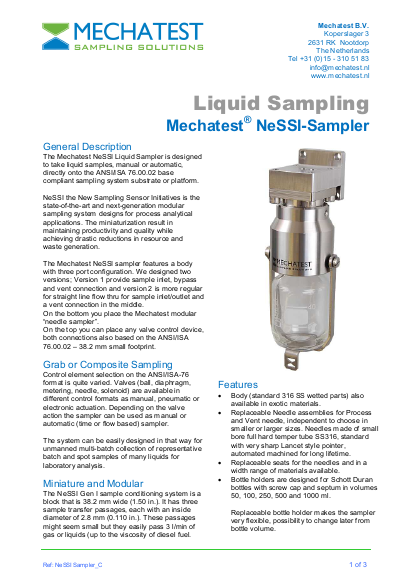 Mechatest brochure; The Mechatest NeSSI Liquid Sampler is designed to take liquid samples, manual or automatic, directly onto the ANSI/ISA 76.00.02 base compliant sampling system substrate or platform. 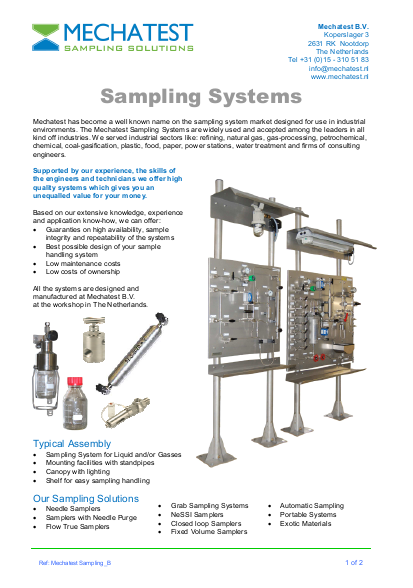 Mechatest brochure; Mechatest sampling systems designed for use in industrial environments. We served industrial sectors like: refining, natural gas, gas-processing, petrochemical, chemical, coal-gasification, plastic, food, paper, power stations, water treatment and firms of consulting engineers. 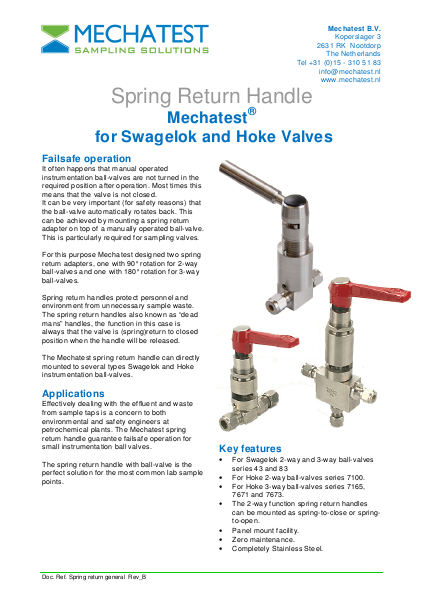 Mechatest general brochure; Mechatest Spring Return Handles for Swagelok, Hoke or Fitok Valves. Spring return handles protect personnel and environment from unnecessary sample waste. 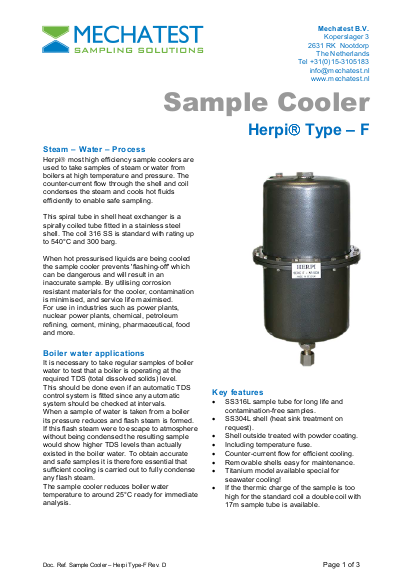 Mechatest brochure; The Herpi steam sample coolers type-F are suitable for high pressure high temperature steam applications. 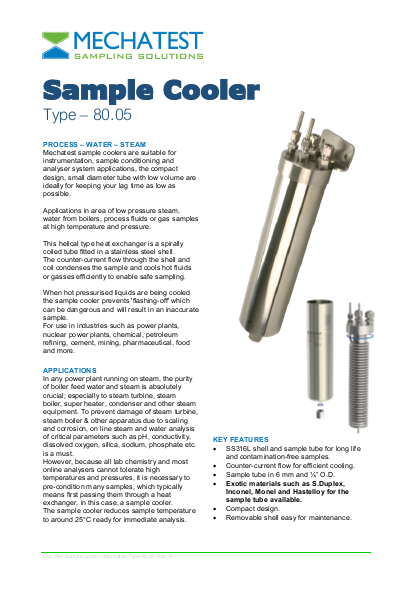 Mechatest brochure; Mechatest sample coolers are suitable for instrumentation, sample conditioning and analyser system applications, the compact design, small diameter tube with low volume are ideally for keeping your lag time as low as possible. 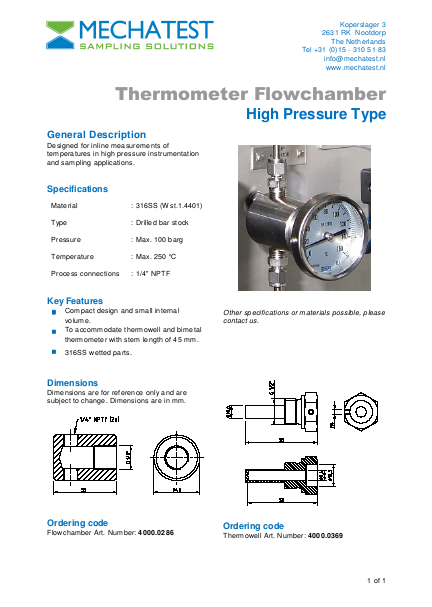 temperatures in high pressure instrumentation and (steam) sampling applications.